Join us this Thursday at 12:30 p.m. when Cindy will do an "in the hoop" demo using our new CORK fabric. 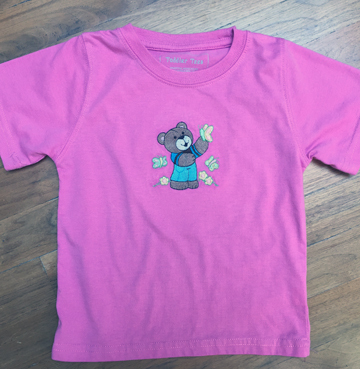 If you have an embroidery machine (or want one!) this is a great opportunity to see what you can do in the hoop. This cute panel arrived last week with a tossed chicken coordinate. Judith is working on a set of placemats using the panel. These blocks would also work up nicely into potholders, a table runner, wall hanging, or small quilt. 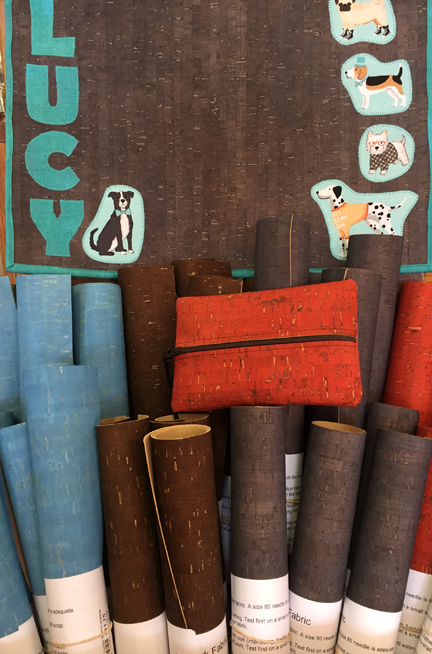 We now have cork fabric in stock, with more colors on the way. Cork is a renewable resource, extremely durable, easy to sew, easy to clean, and the projects you can make using it are limitless. Think bags or trim on bags, placemats (pictured here is one for Karen's pup), notebook covers, Diva wallets (we have a sample at the shop - cute! ), coffee cup cozies, mouse pads, jewelry, and so much more. Any of these would make great gifts. Come by to check it out. 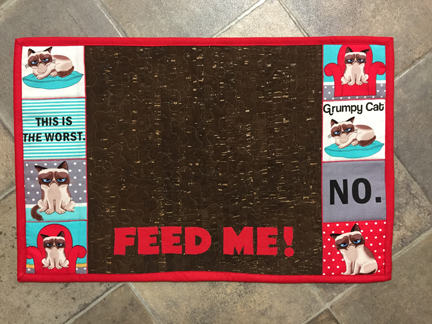 And not wanting to leave the felines out of the fun, we made a Grumpy Cat placemat this afternoon. Feed me! Making these two small project we were able to experiment with using fusibles, raw edge applique, and free motion quilting. It all worked out great. You may remember from the June meeting that Sue Ryter offered to do a class on dyeing silk scarves. It's set up for Friday, July 28th at 9:00 a.m. - 12:00 noon at the Calvin Denton Room at Empire Electric on HWY 491. Sue has all the supplies we need, and if you already have "Set-a-Color" paints you could bring those and play with painting a picture on the scarves. We will be using rock salt and table salt to make intricate effects with the paint. I suggest you bring an apron! We’re working our way through the year creating these adorable raw-edge applique wall hangings. Make them with or without the month at the bottom. These fit perfectly in the small wire stands. With the month added to the bottom, the finished size is 12 x 16. Join anytime . . . you can backtrack and make the earlier months or make them later as each month rolls around. 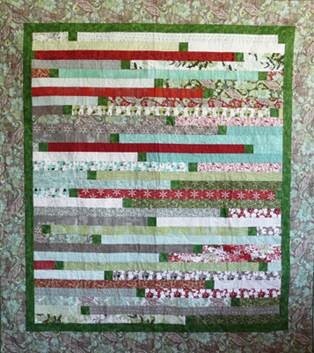 This is a fun, quick quilt that makes great use of a jelly roll (40 pre-cut 2 1/2″ strips). Sew strips together end to end, then sew sets together until you have a lap-sized quilt top. Add a border or two and it turns into a large throw or twin-sized quilt. An instructor will be available for the first part of the sewing day to get you started. Then just sew, and sew, and sew! 1:00 a.m. – 5:00 p.m.
Boxer shorts aren’t just for boxers. They aren’t even just for men . . . but imagine the fun ones you could make for the special gentleman in your life. This class is a great introduction to garment sewing, something that we’ll be offering much more of starting in September. Tricia will be your instructor. We’ve ordered special, soft “pajama” elastic for this project. Guest teacher Caroline Spurgeon will teach a full-day class in twining on Saturday, July 22. Twining is an ancient technique that is quick and easy to do. Twining is suitable for a variety of projects and adaptable to many materials. Twined bags have many uses, depending on the size and material used. They may be simple and durable bags for shopping, knitting or book bags, or elaborate bags made with fine yarns and intricate in design. Students will be working on their own adjustable loom. We will begin with the warping process and continue with the basic techniques and complete with finishing ideas. Students will leave class with a finished bag and ideas for twining more of these useful bags. Supplies: scissors and heavy or bulky yarn (we have this in stock). Looms will be available to borrow for class, and you may purchase one from Caroline if you wish. 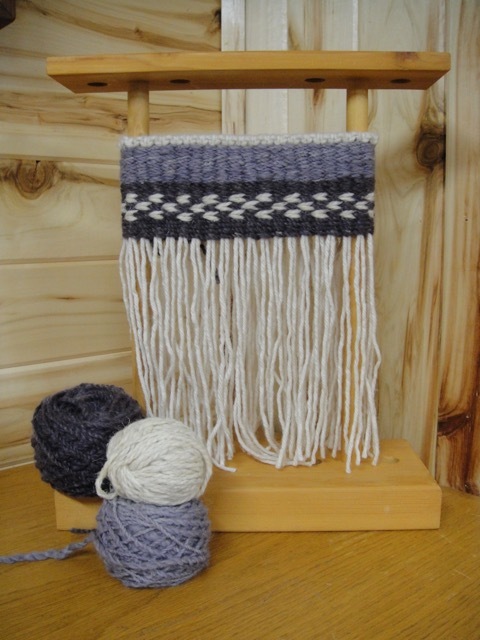 She will furnish warp yarn and items to accessorize your bag. Ages 14 up. Click here to see all yarn shop classes. Learn how to successfully embroider on knits in this Make & Take class with Cindy. Bring a T-shirt, tank top, or other knit garment, along with your machine and a hoop sized for the design you’d like to use. Bring a design or a blank USB stick and choose one when you arrive for class. We’ll discuss design placement, hooping, and stabilizers. You can do this! NOTE: Cindy used “Teddy Bears 3” from EDS to make this cute sample. We have two items of interest for our knitting and crochet customers. First, we'd like you to know when you can expect staff to be working so that if you have questions or need help on a project you'll know when to come in. Anne works Tuesday, Wednesday, and Thursday from 11-5. Sue works Monday, Friday, and Saturday from 11-5. Sue is our resident crochet expert (knitting, too!). This schedule occasionally changes due to vacations and what not, so you are welcome to call us at 970-565-7541 to see who's here if you need help with a project. The other change is related to knitting needles. Now that we've been open for more than a year, we have a better sense of what knitters want and use. As such, we're phasing out addi Turbo circular needles and replacing them with the full line of Lace circulars. The Lace needles have sharper tips and are not as slippery. We will continue to carry Rocket circulars which have sharp points but have the same finish as the Turbos for faster knitting. We will no longer carry aluminum straight needles since most people use circulars. If you like straight needles and want to round out your collection before the addi straights are gone, hop on down to the store and stock up. We will still carry bamboo straights and circulars, as well as our other needles and crochet hooks. We are always happy to special order anything you need (or want!) that we don't have in stock. This goes for not only needles and other notions, but for yarn as well. 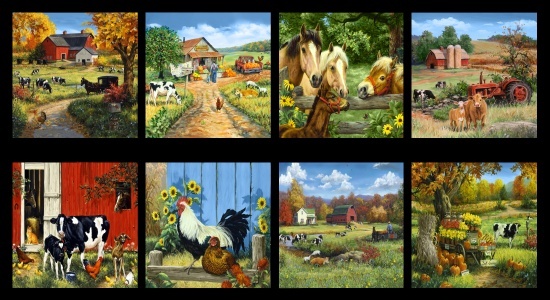 Thank you for your continuing support of the Yarn Shop at Cortez Quilt Company. Machine embroidery anyone? All of our in-stock embroidery designs are 20% off! Many to choose from, including "in the hoop" projects. Don't miss out. Offer expires on Saturday, July 22 at 6 p.m. Limit four per person. You must mention that you saw this offer in the Quiltzette to receive the discount.